The 31-Day Food Revolution is an eater's guide to liberation from a toxic food world. It presents an action plan for eating food that is healthy, humane, sustainable and delicious. Follow Ocean's simple and affordable step-by-step actions and discover amazing secrets along the way, including how to stop food cravings, what the best snack foods are, time-saving habits and what's hiding in your food labels. 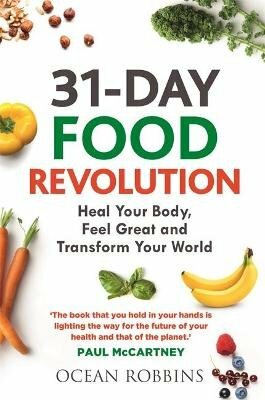 In just 31 days you can: * use the restorative power of foods to heal your gut * lose excess weight * dramatically lower the risk of diseases including cancer, heart disease, dementia and diabetes * contribute to a healthier planet Focusing on whole foods, plant-powered eating, cutting out sugar and improving overall nutrition, this book is a road map to a healthier life and a healthier world.